What are system requirements to PC with the installed ASTER software? + 1. An approximate PC configuration for 6 users? The performance of your PC depends on its software. The only obligatory requirement for the hardware is the possibility of connecting at least six monitors. You can do it by using one video card with four outputs (if your motherboard has 2-3 outputs and your CPU has integrated video) or two-three video cards with two video outputs (For motherboards with at least three PCIx16b slots). It is essential that you use the power supply board with sufficient capacity (which should 1,5 times exceed the total capacity of your hardware). A separate video card should be used for the working station with several monitors. Motherboard ASUS LGA1150 H87-PLUS H87 with two PCI-Ex16 and three video outputs DVI/DSub/HDMI – In BIOS settings you should enable the possibility of using integrated video along with the discrete one. 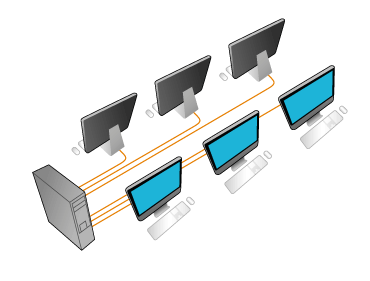 This is an approximate configuration for assembling the desktop tower with the possibility of connecting six monitors. In order antivirus has not been blocking ASTER program working, add the folder with the installed ASTER to the exception - C:\WINDOWS\system32\mute32.dll for WinXP, C:\WINDOWS\System32\drivers\mutenx.sys for Win7/8. Presently Aster operates with all video cards based on ATI/Nvidia/Intel chipsets. Monitors may be connected also via external USB video adapters on chipsets from FrescoLogic (Win7/8/10) and DispalyLink (Win10 only! ), and as a wireless monitor (WiDi) (Miracast/WiDi). Others external USB video adapters as well as software emulations of displays (alike AirDisplay or IDisplay) was not tested. To start Mozilla Firefox it has to be enough, and you’d better reinstall Chrome, set it for all accounts at the computer with the alternative setup file "Download the alternative installer Google Chrome." * Note: It is recommended to install plugin AdBlock for any browser in order to avoid ads and some other stuff. + 5. How do I get remote access to the computer? 2. Connection with such software as RAdmin, TeamViewer, UltraVNC, etc. + 6. How to reactivate Aster? 1. By spending the limit of serial number activations. It occurs always when Aster is activated via Internet as defined in User’s Manual Clause 3 . This method is acceptable only in case of PC replacement or replacement of your PC’s processor. Simultaneous start-up of the application Steam two or more times is possible using a special program (so called “sandbox”). There are several programs of this type including embedded in antivirus. Launching was tested by means of the program Sandboxie. Upon its installation in the shortcut context menu appears the menu item "Launch in sandbox". In the free version you can use only one sandbox at a time, however this is enough to start two copies of the Steam. For example, on the first work place we start the Steam in the usual fashion, and on the second in the sandbox. As a result, we get one copy of the Steam client on each work place (for each copy its own Steam account is required). In that manner you can also launch certain applications/games which don’t directly support the start-up of several their copies. When problems appear, especially with online games, when you run Steam, in Sandboxie you should check the box "Run as UAC Administrator" . Game "Dota2" can serve as an example. Here you cannot start searching for the game while the players from Aster workstations are united in one group. + 8. What are system requirements to PC with the installed ASTER software? - required number of video inputs to connect all monitors. - not to use SLI/CrossFire modes. - not install any additional drivers/utilities for keyboard and mouse. - if more than one wireless set is used the mutual interaction is possible so it is advisable to check their operation on buying. 8.5. The HDD volume should be sufficient for OS installation and requirements of all users. 8.6. The RAM amount should meet the requirements of tasks to be run on PC. - 500 Mb on average for each workplace. RAM is an easily scalable PC resource since at any moment a couple of RAM-cards may be added, and if the mother card lacks additional slots, the oversize modules can be used instead. However the best of all would be to follow the rule "the more RAM the better", naturally within reasonable limits. However for x32 OS versions more than 4 Gb cannot be used anyway, and due to redundancy of the part of address space for video RAM, the amount of accessible memory in OS can decrease to 3 Gb and less. So launching more than two ASTER workplaces on x32 systems may result in deficiency in RAM for resource-intensive application execution. - quality of power supply and specific features of devices themselves. USB 5 (25*) m - five 5-m segments. For a greater number of workplaces you need anyway the preliminary system testing and adjustment. Free downloading the 30-day version of Aster you may here: https://www.ibik.ru/ru/downloads, a tryout version has no functionality restrictions and is limited just by a free to use time. + 9.Important notes and known issues (only related to running on Windows 10). 1.Before you enable the ASTER V7 software on Windows 10, it is necessary to extend the desktop on all the displays and set desired resoluiton for each display. 2.Applications that change screen resolution may work improperly, particularly game applications may fail to enter fullscreen mode. For running games please use their windowed mode. Main – Pro licenses for2 or 6 workplaces. These licenses are indefinitely valid and in the course of a year are free for upgrading ASTER up to the latest version, if necessary, adding workplaces, or transferring the license (see the note) to another PC. Main licenses for 2 or 6 workplaces can be activated or transferred as one piece only – the partial activation on several computers is not supported. Additional - Pro-1 license for one workplace more, that is it allows for connecting additional workplaces subject to the existence of an already activated main license Pro-2, or Pro-6. The Pro-1 license cannot be activated on its own, without an a priori installed main license. This license the same as Main is indefinitely valid and can be transferred to another PC. Home – Home license allows for creating just 2workplaces per year. Home License is a one-year subscription, i.e. after 1-year use you have to purchase a new license. Please be aware that the Home license supports just2 workplaces and cannot be extended to a greater number of workplaces, and also cannot be deactivated and transferred to the other computer – this is an inexpensive option for personal use. Note. You have to get right the sentence «Transfer of a license to another computer». From the standpoint of ASTER licensing system, a computer is identified by a hard disc with installed Windows and a type of processor installed on the computer. So «Transfer of a license to another computer» means not only transfer to the really other computer (base unit) but also replacement of system disc and/or processor as well as reinstallation of Windows to another disc on the same computer (see FAQ item 12). All types of ASTER licenses can be simultaneously activated on one computer only. If CPU and hard disc of PC (where OS is installed) remain the same–a license will be valid with any other changes of hard/software. After disc formatting, reinstallation of Windows, etc., just repeat activation using the same key. + 12. Why do the working stations have identical desktops? Personalization parameters are not linked with the working station and can be adjusted individually for each user account. Therefore, if you wish to have individual personalization settings, use a separate user account for each working station. + 13. How can a workplace be made without the monitor? To run workplaces you have to link a monitor. However you may simulate a connected monitor by means of a dummy panel, or if the monitor has several interfaces (for example, VGA+DVI), you may connect one monitor several times, in doing so you may switch between workplaces just by selecting a required signal on the monitor. + 14. How can to assign several monitors to one working station? In order to assign several monitors to one working station, you have to use a separate graphic card for it, as a working station with several monitors cannot share its graphic cards with another working station. However, NVIDIA Surround and AMD Eyefinity technologies give us a possibility to use extra monitors for a working station on the shared video card, and the working station can use only the monitors with the shared video card. These technologies allow uniting several monitors, with the system treating it as one monitor, which might be assigned to one of the working stations in ASTER settings. However, one has to realize that the monitors, “grouped” in this way, present a single continuous screen and, consequently, cannot work in different modes. Troubles with the PC operation, for instance, BSOD / freeze at the OS start or a blank black screen when turning on the PC, can be repaired in the following ways. - If you interrupt the system boot by pressing the "Reset" button, or, if you do not have this button, simply turn off/on your PC at the very start of ОS boot (right after the Windows logo and whirling dots appear), it will transfer ASTER into the safe mode for one boot in which you can disable or re-adjust ASTER. - If you interrupt the system boot 3 times at a run (by the method described above), the recovery mode will start when you do it for the fourth time. In this mode you can select the safe mode boot or the other options which can recover OS boot. - Moreover, you can go to the recovery mode with the help of recovery disc (CD/USB). Safe mode reboot options from the working OS are not presented here. 1. The software which has to be obligatorily uninstalled before installing /starting ASTER. This group includes the whole list of ASTER analogues: BeTwin, SoftXpand, WM Program and other similar software. Sometimes we have to automatically launch a program whose parameters depend on an ASTER workstation number. A small utility program wplaceno allows one to find out the number of the workstation where it was launched. The workstation number is returned in the exit code which can be used for setting launch parameters in other programs. In bat-files the terminal number will be available in the %errorlevel% variable. The iTalс program used for the correct operation in all workstation is to be started with the parameter containing the port linking to the program client, one for each workstation, for example 4001 – for the first workstation, 4002 – for the second one, etc. If you put this command file in the autostart partition for all users, then, when a user enters the system, at each workstation the iTalc client will start with the required port number. The wplaceno utility program must be put in the folder with ASTER, аnd, if necessary, the path to ica.exe must be changed, too. Our thanks to user Frederik Dewanckele for the provided information. The main idea is that a USB flash drive (or the HDD/CD partition) can be used as an NTFS folder in the “Computer management” snap in. It can be done independently, without additional software, but USBDLM will help to make this process automatical. 3. Run the file C:\Program Files\USBDLM\_edit-ini.cmd. After that the USBDLM.ini file will be created and opened for editing in the same directory. 4. For each USB flash drive in the DriveLetters segment of the USBDLM.ini file the parameters should be added which will determine the actions of USBDLM after its connection. The parameters can describe both the connection port [PortName], and the device as well [DeviceID], [VolumeSerial], etc. Depending on the task, one can use various parameters and their combinations. The UsbDriveInfo.exe utility from the catalog C:\Program Files\USBDLM\ allows one to obtain the required data about the connected device. To do this you should run UsbDriveInfo and choose the required device from the list. After that you will see all the necessary data in the field on the right. We will need the “USBDLM Criteria" section – it is at the very end of the list. Thus, any USB flash drive, connected to port 2-12, will be installed in the folder "usb-stick" on the desktop of User1. In this example 12 is the number of the usb hub port, and if its value is changed to?? (the number of signs ? must equal the number of digits), then the USB flash drive can be connected to any port of this hub. allows us to identify the USB flash drive and install it in the folder “usb-stick” of the desktop of User2, no matter which USB port it is connected to. 7. Add several entries in USBDLM.ini in the partition DriveLetters to describe all the necessary options. In this case parameters PortName, DeviceID and others can be combined at one’s discretion. * The other users who have access to the desktop (in this case – of User 2’s), can also get access to the data in the USB flash drive, installed in the folder on the desktop.